Today, on the Solemnity of Corpus Christi (The Body and Blood of Christ) I join in with the many other writers and Catholic faithful who have been sharing why it is we remain Catholic. In a world where our faith seems upside down and topsy-turvy, where to ascribe to a belief that puts us at odds with the mores of the day, it can certainly baffle the masses as to why anyone in their right mind would be willingly devoted to the Catholic faith. Even more baffling perhaps is why an educated woman would choose to become Catholic, to willingly surrender her life to a faith that so many understand (wrongly) to be a foe of freedom, liberty, and women. 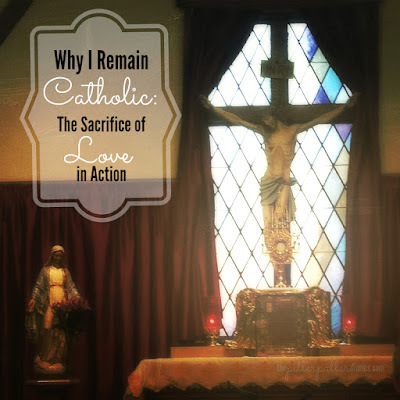 Why did I become Catholic? The (very) short answer is that I was invited. Why do I remain Catholic? The very short and real answer is because Jesus meets me there every day if I will have Him. I am Catholic because Jesus has drawn me to Himself. I remain Catholic, because in the example of the Saints who have walked before me, offering their lives as an example of love in action, and in the faith that has been passed on from the earliest days of the Church, Jesus call me to grow deeper with Him. I remain Catholic because in the Church, God humbles Himself to meet us over and over in the Sacraments, especially in the Eucharist and Reconciliation. I remain Catholic because all my senses are filled with the holy in our understanding of everyday sacramentality. I remain Catholic because I am forever challenged by our understanding of dignity of life and the value of all creation. I remain Catholic because through the lens of this rich faith I understand the redemptive value of suffering, of uniting my pain to the indignity suffered by Christ on the cross for the good of all the world. I remain Catholic because within the tradition of the Church lies such a deep and diverse expression of our longing for and worship of God, our Creator, the Father. I remain Catholic, because despite the (mis)understanding of the world, there is a holy place for my dignity as a woman in the history and tradition of the Church. I remain Catholic, because for over two thousand years, disciples and apostles of Christ have been sinking deeper and deeper into the mystery of faith, into the heart of Jesus, leaving behind their wisdom and blueprints for contemplating the face of Christ. For two thousand years, they have been holding on to the deposit of faith left behind by Jesus and the first apostles. This is not to say that I believe we as body of believers are without fault. I am the first to admit that there is always room for growth - that our humanity keeps us from living out the fullness of our faith all too often. Short of heaven there is nothing perfect on this earth. So I come back to the foot of the cross, to the Real Presence of Jesus to remind me what the heart of my life as a Catholic is to be - the sacrifice of love in action. Not perfect music. Not the best slogan. Sacrifice for the redemption of the world - bringing others into a life with Him, because His sacrifice was for the whole world and He thirsts for us all. Sacrifice and love for neighbor because Jesus has asked us to be one in Him and with each other. There are those who would love nothing more than to distract me from the sacrifice of the cross - to avert my eyes to Christ's example of love in action. There are those who would have me embroiled in the political battles of our time, forgetting that these battles have existed for all of time and will continue until the coming of the Kingdom. I say to them, you shall not prevail while I have Jesus, Son of God and Son of Man, Lord, Redeemer, and Savior, offering Himself for me through all of time. In the Eucharist, in the sacrifice of the Mass, in the lives of the Saints, in the mystical body of Christ, in the deposit of wisdom and faith safeguarded by the Church, I find Jesus. He is why I became Catholic and He is why I remain Catholic. Now that you know why I am and remain Catholic, let's just get out there and love 'em like Jesus, shall we?